Danny Boy works as a grease monkey, which doesn’t exactly afford him the finer things in life. After he lands a date with a knockout waitress named Vera (Jeanne Cagney), Danny’s aspirations for a good time are kicked back down when he realizes he’s flat broke. He lifts a $20 from the till with the intentions of paying it back on Thursday, when one of his pals who owes him is supposed to pay up. The following morning, the bookkeeper shows up. To keep his job, Danny runs across the street and buys a fancy watch on credit. Then he hoofs it to the pawnshop and hocks it for $30. Next thing he knows, a cop is threatening him with grand larceny, under the jeweler’s hunch that Danny is going to skip town without paying for the rest of the watch. He has 24 hours to pay the rest ($100) or else it’s prison for Danny Boy. From the $100 owed for the watch, Danny falls into an increasingly more serious spiral of crime. This naive schlub who stole $20 from the till find himself rolling a drunk, stealing a car, robbing a safe, and, inevitably, committing murder. The chain of events started by Nick’s lust also reveals the greed that festers the hearts of other men – the type of people who initially scoff at Danny’s situation, then exploit it when they see dollars signs for themselves. Nearly everyone he encounters has one hand in his pocket. Of course, Danny doesn’t hold himself accountable for anything but the $20. “It was Nick who got me into all this,” he pitifully whines at one point. The Nick he speaks of is an arcade owner who’s mixed in with Vera. Nick is played the almighty Peter Lorre, who delivers his refined moroseness. When Nick and Danny get into a brawl, it ends quickly with Danny on top. But what he lacks in brawn he makes up for in cunning blackmail prowess. Everyone, from Nick to his boss, seem one step ahead of poor ol’ Danny. There’s really nothing remarkable about director Irving Pichel’s approach, the way it is shot, although the nighttime arcade robbery has some nice tense moments and photography. The matter-of-fact way in which the murder is filmed makes it more gruesome. The film’s climax is set on a pier, with Danny so close to escape. A lot of noirs close their curtains by the seaside (Night and the City, Panic in the Streets, Force of Evil), making the ocean a great big symbol of freedom that can never be. 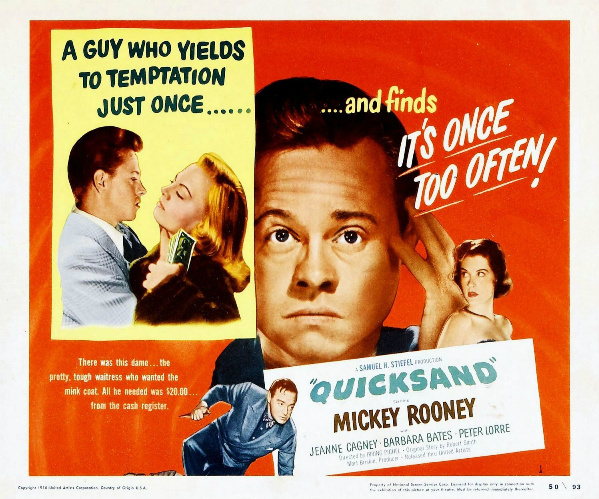 Quicksand is a great little morality play warning viewers about the pitfalls of naked greed. As the tagline reads, “A guy who yields to temptation just once…and finds it’s once too often!” More than that, it really drives home the message that everyone in the whole goddamn world is corrupt more than you can possibly imagine.